The Guitar Column: Fender Furniture | Fender HotSeat and Stratocaster Tables! 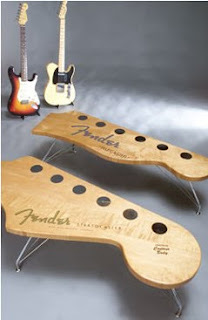 Fender Furniture | Fender HotSeat and Stratocaster Tables! Outfitting that newly refurbished den or basement jam room? Think out of the IKEA box for a bit and consider these. With designs licensed from Fender, Overkill Design LLC is producing a range of HotSeats and Fender Tables. 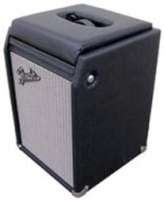 The HotSeats are designed to mimic the look of a Fender combo amp in either Tweed or black Tolex. A cool feature is the strategically placed volume knob that releases the seat cushion allowing access to storage space within the HotSeat's cabinet. 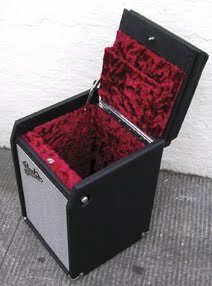 Great for stashing cables, pedals and other contraband. Measuring 13" long, 13" wide and 19" tall and weighing 22 lbs. these HotSeats would be difficult to move around were it not for the amp handles, accessible through the clever cut-out on the seat cushions. Overkill's Deluxe Stratocaster and Telecaster Tables are solid maple, custom tinted and lacquered for a vintage look. Six tuning peg caps made of chrome plated steel disks are mounted flush to the table surface while the Fender logo and lettering are silk-screened and laquered over to stand up to everyday use. Chrome-plated legs and a unique stamped serial number complete the package. I'm totally digging that natural wood and detailed lettering. I mean, seriously, wow..
Overkill is also producing a Standard Stratocaster Table made of a varnished wood composite with a vintage tint, silk-screened tuning peg caps and Fender lettering with silver powder-coat legs. I've never wanted a piece of furniture so much in my life. who wouldnt want a fender maple table right in their living room man. haha! I see Googling for Fender maple fingerboards brought you right here Dom! Right on. Great new EC Strat you've got there!